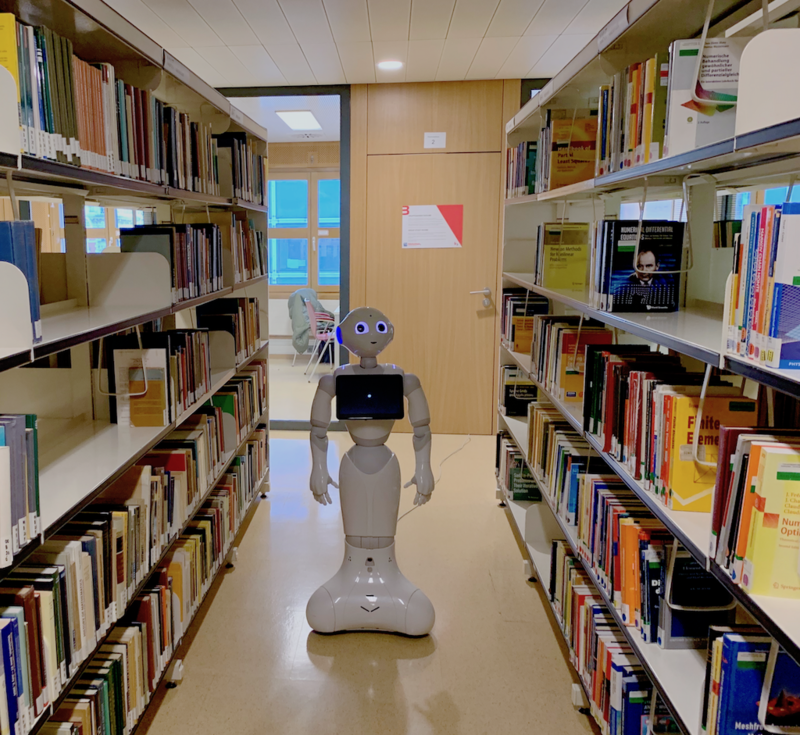 To support the realization of research projects and the dissemination of findings, a living lab has been established at the library of TU Wien. The doctoral students who are part of the TrustRobots doctoral college will work on projects in the living lab. For the individual PhD students, this will allow for in-depth exploration of their research topics. An additional advantage of the Living Lab approach is that it will foster a better understanding of the social and cultural aspects of integrating robots into our society. The Pepper robot is a humanoid robot that is mainly intended for social interactions. It was developed by Softbank Robotics. The robot is equipped with a tablet, touch sensors, microphones and LEDs to support communication. Infrared sensors, cameras and sonars support navigation. The robot has 20 degrees of freedom, which allows for expressive body language. The Panda robot was developed by Franka Emika GmbH. The system can be used for manipulating objects. The robot arm has 7 degrees of freedom and can be operated via Apps. The Sally robot is a mobile robot platform developed by DS AUTOMOTION, which can autonomously transport goods up to 100 kg. SALLY senses its environment using a 2D laser range finder to localize itself and navigate autonomously. To enable a broader range of human robot collaboration tasks, we intend to mount a KUKA LBR iiwa robot arm on top of it. The KUKA LBR iiwa is a lightweight robot arm with seven degrees of freedom for safe human robot collaboration. It can lift a payload of up to 14 kg.